I want to make a collection of books that I could read to my students, my students would like to read, and books I could use in a small group setting. I am an excited future teacher and a huge enthusiast of never being too young to be exposed to good books. Where the Sidewalk ends by Shel Silverstein is a level Q on the Fountas and Pinnell reading level scale. 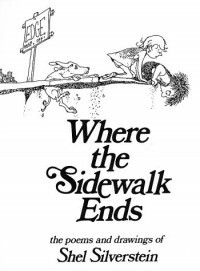 Where the Sidewalk Ends is a compilation of poetry pieces by Shel Silverstein that are silly and fun to read. I really enjoy reading these poetry books because as a struggling reader, they give me the confidence to read and help me enjoy it. These poems would be great to use in different literacy centers, would be great do practice during small groups, and can help assess fluency.